Let me ask you a question. How do you keep track of your leads? Please God don't say post-its. Or random slips of paper. You do have a lead tracking system, right? If your answer is “not really” or you aren't sure, then read on Photographer. Let me help you out on this one. I know what you are thinking, I really do. If she wants you, she'll book you, right? Wrong. Brides are flat out completely overwhelmed. They are trying to plan a major event with a limited budget, resources and time. It's nearly impossible for them to remember the style, price and artistic approach differences between five different photographers. Add in a couple of florists, caterers, cake bakers. The list goes on. So now we understand her overwhelm, but what about you? If you only had to remember one potential bride and her wedding date at any given time, that would be easy, right? But can you remember 15 brides with 15 dates, 15 budgets, and 15 potential consultations? 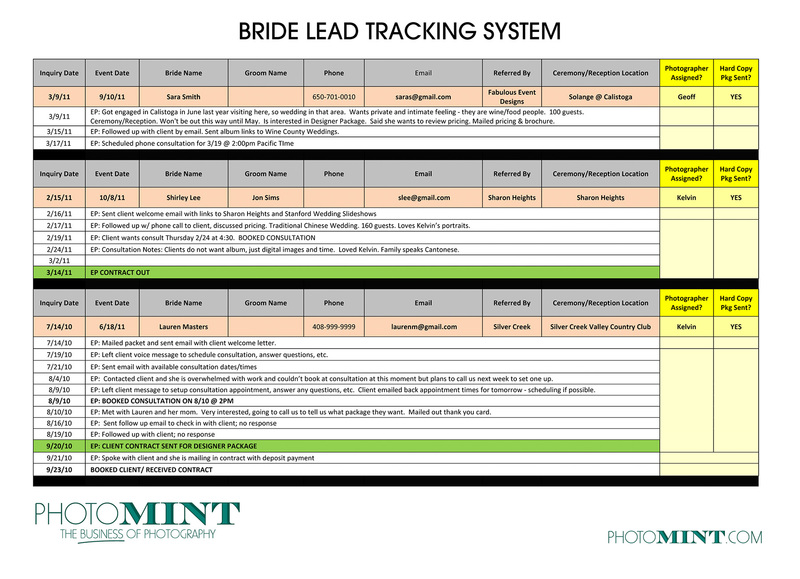 It's impossible to keep track of more than a few leads, so if you are serious about how to book weddings, it is essential to create a wedding lead tracking system. Brides typically take 2-6 weeks to gather information, get recommendations, set up consultations and hire vendors. During this 6 week window, you might be in conversation with 5-30 brides, all at different stages of the decision process. So how could anyone possibly keep track of each lead and if they have been sent pricing, offered a consultation appointment, mailed a brochure and so forth. If you keep track of your leads and follow up with them, your chances of booking more weddings is greatly increased. This could be via shootq, a binder or even a spreadsheet. Anything that's going to be simple and easy to maintain. Just stay away from the post-its and slips of paper or even worse, emails that quickly get buried. You get this info by setting up your email contact form with these fields. Always ask for the venues so you can speak about their location, mention lighting, etc. to let them know you are knowledgeable. This will also give you an idea of their budget based on the type of venue. The other piece of info you should track is how they heard about you. At the end of each year, you review all the sources that sent you leads so you know which marketing methods are working and which are not. That way when planning out marketing for the next year, you'll know where to focus. When a lead comes in, you should follow up with them SEVERAL times until you get a consultation appointment scheduled. I recommend following up multiple ways until you either get a consultation scheduled, a no, or multiple contacts get zero response. One trick I recommend is to send out an email asking if they would like to schedule a consultation and offer 3-4 specific openings for consultation appointments. Sometimes they are just so busy and overwhelmed that it helps to gently guide them to the next step in the decision making process. By tracking your leads and staying on top of them, you will definitely increase your wedding bookings. And that's going to add to your bottom line. What else do you do to increase your booking rate? If you didn't read the Art of the Follow Up, it's the companion article that goes with this. Develop your lead tracking system, and then follow up with your leads! This makes me look so disorganized it’s untrue! Thank you for giving us all this information. I shall take it on-board and start to implement as of NOW! what you see on the blog post is what is available. Hi Lara, is it possible to share that spreadsheet? I love the idea. Yes, I created a pdf version of the same spreadsheet we used, with real examples. If you just click on the spreadsheet, it will get larger and can be printed. Yes, when its an open ended question, it’s harder to make a decision. Like if someone asks you what you want for dinner-when you are just overworked and over hungry, you dont want to or can’t even think of what you want. But if same someone offers steak or spaghetti, it’s much easier to choose and be done.